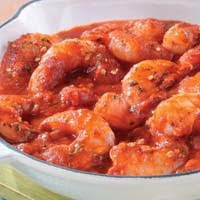 Crushed red pepper adds some "heat" to this quick-cooking, sauteed shrimp dish served in a zesty tomato sauce. Heat the oil in a 10-inch skillet over medium-high heat. Add the shrimp and garlic. Cook for 3 minutes, stirring often. Reduce the heat to low. Stir the sauce, parsley and pepper in the skillet and cook until the shrimp are cooked through. This entry was posted on 7:58 PM and is filed under Fish and Seafood . You can follow any responses to this entry through the RSS 2.0 feed. You can leave a response, or trackback from your own site.